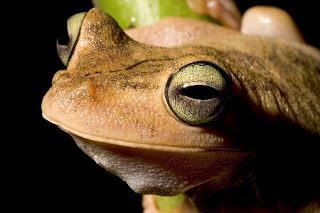 "... a victim of the deadly chytrid fungus, the green-eyed frog (pictured) has plummeted to only a few hundred individuals in Costa Rica and Panama, according to the "Rarest of the Rare" report. Habitat lost to logging and deaths due to agricultural chemicals have dealt additional blows to the 2.5-inch-long (6.5-centimeter-long) frog. Breeding the amphibian in captivity may be the species' last hope, according to the Wildlife Conservation Society."